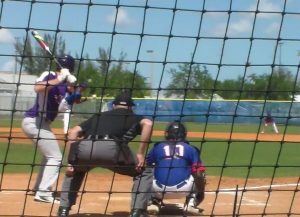 Florida Memorial upset top-ranked Edward Waters in double header action topping the Tigers in game one 3-1, then held on for a 2-1 win in game two ending EWC eight game winning streak. Coming into the game, Florida Memorial was ranked No. 1 in the Week 1 (March 13, 2018) first poll in Black College Nines (BCN) HBCU Baseball small school Top 10 ranking of the season. The latest (BCN) poll Week 2 (April 3, 2018) has Edward Waters in the No. 1 spot leapfrogging FMU who slipped to No. 5 after a four-game losing streak. Florida Memorial put together enough big plays to earn a marquee 3-1 win over No. 1 Edward Waters (21-12). It was the Lions’ first win over the top-ranked team in the nation in school history. The Lions didn’t need a perfect performance to knock off EWC, leaving runners on base and allowing EWC to mount late rallies before sealing both victories. Both teams really battled, wanting to win these games, but Florida Memorial was clutch under pressure. In game one, EWC scored its only run of the game as Bryan Rodriguez doubles to center field and scoring on a Kelin Washington single. Washington was thrown out at second trying to turn the single into a double. The Lions run came in the bottom of the fourth inning as Sergio Chil, ranked in the top 20 in batting average in the NAIA, singleed and stole second base. Kyle Parks came in for Chil as a courtesy runner, advances to third on a passed ball and scored FMU’s first run on a fielding error by EWC’s Will Boggs. In the fifth inning, the Lions add another run as Raymond Guerrero belted a home run to right field for a 2-1 lead. They would plate one more run in the sixth innings for the 3-1 win. In game two, the Lions scored in the bottom of the second inning on back to back singles by Alex Gomez and Jose Chavez. Gomez scores on a Pablo Delgado single for 1-0 lead. FMU would add another run in the fourth. Sergio Chil singles, Emilio Marrufo laid down a sacrifice bunt to the pitcher, moving Chil to second base and then Chavez hit a double, scoring Chil for a 2-0 lead. Edward Waters’ lone run came in the top of the sixth inning. Jordan Pontious and Wyatt Reid both singled and moved to second and third base on a balk call on FMU pitcher Kyle Parks. Next batter Carlos Cabrera walked and a Tyler Rich single scored Pontious. The Tigers had chances to plate more runs, but Christian Montesinos struck out looking, leaving the bases loaded. The positive is both teams really fought hard the entire doubleheader and had opportunities to get more runs. But pitching and defense prevented more runs from scoring. In the end Florida Memorial improves to 22-14 overall as the Tigers fall to 21-14.